RAKESH KUMAR AGARWAL, Director of M/s. Purbanchal Laminates Pvt. 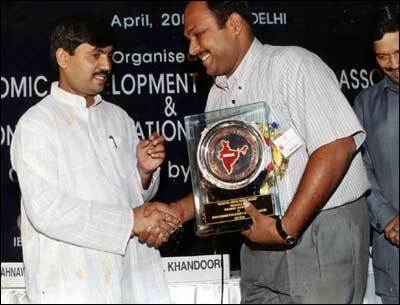 Ltd., Gandhidham is a successful businessman from the North East having vast experience in Face, Core Veneer and subsequently Plywoodâ��s is receiving a Covetous Award â��BHARATIYA UDYOG RATAN AWARDâ�� from the Honorable Union Minister of State for Surface Transport on behalf of the Indian Economic Development & Research Association (IEDRA), New Delhi for his Individual Achievements and National Development. 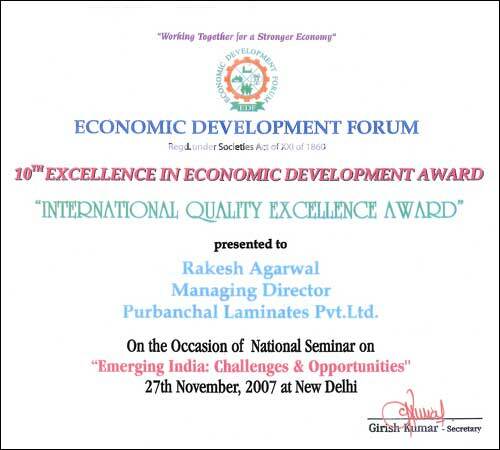 He is also awarded with the â��International Quality Excellence Awardâ�� by the Economic Development Forum for his individual working on â��Emerging India : Challenges & Opportunitiesâ��. He is also a recipient of â��UDYOG BHARATI AWARDâ�� for his â��Corporate Achievement and Social Responsibilitiesâ��. The Company has also been rated SE-1B by NSIC-CRISIL â��for highest performance capability and moderate financial strengthâ��. Company has also been rated as C-4 by SMERA. Company acknowledges its responsibility to safeguard the interest of future generations by implementing initiatives to conserve natural resources and protect environment. Being fully environmental conscious it has already acquired the ISO : 14001 Certification at the very initial stage and planted 200 Trees in the factory premises itself on its inception. During Jan 2010 it has also planted 1000 Trees of Teak and Neem species at 4.00 acre land at its Greenhouse situated very nearby the factory premises. Moreover, it has joined a Project for plantation of 4000 Trees through the NGO, Gramin Vikas Vigyan Samiti (GRAVIS) in BAP Block of Jodhpur i.e. the Desert of Thar (Rajasthan) vide a MOU signed with GiveIndia who has already started plantation. The main motto of the parent company is now to plant one Tree for manufacture of every 36 sheet of Plywoods. The company has initiated the process of obtaining Forest Steward Certificate from a prestigious accredit able body SGS. Holding this certificate will signify our consciousness towards conservation of forest which is a basic need of this troubled age of Global Warming and deforestation.